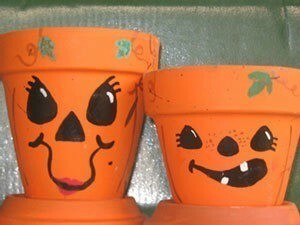 A fun homemade decoration for Halloween, is a clay pot Jack-o'-lantern. This is a guide about clay pot Jack-o-lanterns. Pumpkin pots add personality and charm to Halloween and Thanksgiving décor. If you make them in September, you can add soil and seeds so they will be overflowing with fragrant herbs, just in time for holiday cooking. They can also hold candy, napkins and silverware, or a candle. Used as a gift for dinner guests, they can be incorporated into a table setting. Paint the pots and saucers solid orange. Use 3-5 coats for rich, consistent coverage. While the pots and saucers are drying, sketch some designs for faces onto paper (see photo for samples). You can make the faces resemble family members. Use family photos for ideas. Once you're comfortable with your design, pencil it onto the pots. With fine brushes, paint your face design black. Use white for teeth and accents on the eyes. Add stripes in brown paint to make the pot resemble a pumpkin. Also paint vines and green leaves in place of hair, above the faces. Eyelashes, freckles, lips, moles, and other quirky accents give the pots personality. When the pots are finished and have dried, spray two coats of varnish or clear spray paint on the outside of the pots and the entire surface of the saucers. If you want your project to be useful in the winter, paint jack-o-lantern faces on one side and snowman faces on the opposite side. When Thanksgiving is over, simply turn your pots around and continue to display them through the winter months.